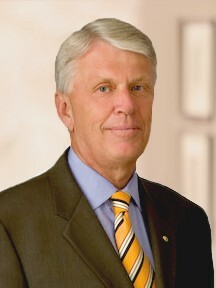 William H. (Bill or Rick) Nelson was president and chief executive officer of Intermountain Health Care until June 2009 when he began a three-year service as mission president for the New York, New York south mission for the Church of Jesus Christ of Latter-day Saints. He also served on the Executive Committee of the Intermountain Healthcare Board of Trustees until 2009 and as national chairman of the Healthcare Financial Management Association in 1995-96. Mr. Nelson previously served on the USUO Board of Trustees from 2003 to 2009 and was Chair of the Nominating and Governance Committee as well as the Music Director Search Committee. He also served on the boards of Beneficial Financial Group, United Way of the Greater Salt Lake Area, and the Healthcare Research and Development Institute. Mr. Nelson and his wife, Christine, have eight children. Mr. Nelson rejoined the USUO Board of Trustees in September 2012, was elected Vice Chair in 2013, is Chair of the Audit Committee, and serves on the Executive and Finance Committees. He co-chaired the 2015-16 USUO CEO Selection Committee that identified Paul Meecham to lead the organization.